Obtaining a treasured piece of memorabilia can be very exciting for collectors. Protecting said item is certainly on the lower end of the fun scale, but vital nonetheless. However, premium items like jerseys can get very pricey to store/display and cumbersome to move. 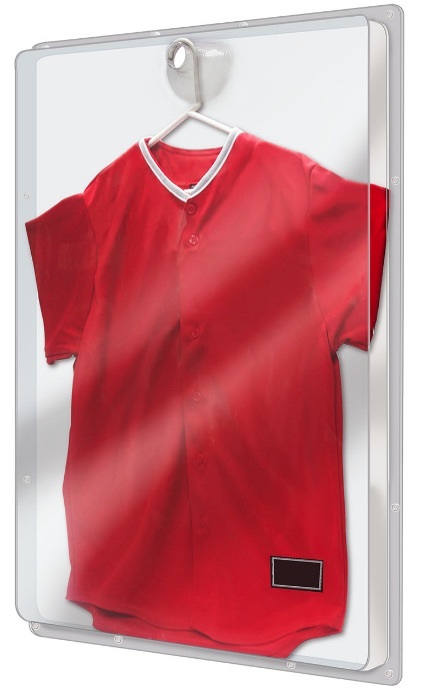 Allowing collectors to easily transport and protect their memorabilia collectibles for an affordable price, the Ultra Pro portable display and storage options include practical solutions for both jerseys and baseball bats. Think of it as a giant clam shell packaging that can accommodate your newly signed jersey. The Portable Jersey Holder is very simple but the product is quite useful for those who are trying to protect an autographed jersey on the go or those who are looking to find an affordable way to store and display a jersey. The case design uses a series of snaps to quickly close up. Beyond that, it has several key attributes. First, the light-weight design makes it easy to move while keeping the jersey free of dirt and dust. An indention knob at the top allows for a hanger to keep the jersey in place in the case and also helps hold the shape without needing more drastic efforts. The large size of the case gives the jersey ample space to hang, preventing it from wrinkling or risking the integrity of the signature. Best of all, the manufacturers' suggested retail price (MSRP) is $24.99. Although regular consumers can likely find good usage from the Ultra Pro Portable Jersey Holder, retail stores are another ideal setting considering the overall value and functionality. Although Ultra Pro already offers several options for storing and protecting bats, the Traveler's Bat Tube adds a new wrinkle that may greatly appeal to collectors who frequent collectible shows or baseball stadiums to get their baseball bats signed or just regularly find themselves transporting bats. The clear tube includes soft rubber caps on the ends that hug the case and ensure a tight seal. While this provides maximumu protection, the new aspect is the adjustable, padded shoulder strap that firmly attaches to the tube for convenient movement. It is reminiscent of something you might find on a nice computer bag or briefcase. It addition to the obvious purpose to store and transport baseball bats, the sizing is also ideal for a variety of other items, including blueprints, paintings, artwork, and other random documents that can be rolled up. The MSRP for the Ultra Pro Traveler's Bat Tube is $20.99.